Heather began Square Dancing in September 1994 at the age of seven with the Wesburn Wranglers Square Dance Club of Burnaby, BC. After a year or so she began Calling with Steve Edlund (the Wesburn Club Caller) as her mentor. Shortly thereafter, she began Round Dancing and Calling at the Preteen Level. For the next 8 years she competed in the annual Pacific Northwest Teen Square Dance Festival and would come home each year with awards for her Calling, Cueing, Square Dancing and Round Dancing. By the winter of 2001, Heather decided to pursue Calling and Cueing beyond the level of the Teen Clubs and Teen Festival. 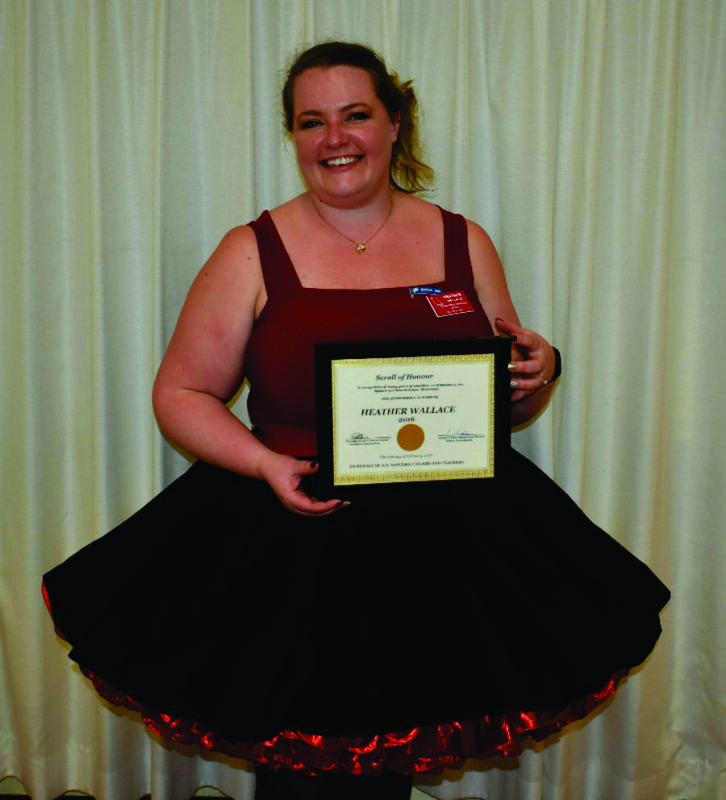 With the support of Steve Edlund, as well as Chris Knowles, Bill Knowles, Ray Brendzy, Dennis Dixon, and Dan Adams Sr., Heather was able to gain the necessary Calling experience and confidence to call to Square Dancers of all ages. She also received support from Cuers, including Bette Berglund, Marg Beatty, Danielle Garbe, Brian Penny and Alison Hampton, and was soon able to fill in for them on their regular club nights. Even though she was only 14 years old, the immense support of the Callers and Cuers in the Vancouver Area enabled Heather to develop into a Caller that the Dancers recognize. During this same time, Heather's father (Blair) became not only her dance partner but also her chauffeur as she was still too young to drive herself to the dances where she was calling and cueing. This father – daughter team became a regular feature at Club Nights. The summer of 2003 was a memorable one as Heather completed a Callers Training School in Chase, BC with Steve Edlund. At the tender age of 16, she called and cued her first full dance at the Abbotsford Summer Dancing. Heather says that this was the beginning of her career as a Professional Square Dance Caller. Heather continued with Square Dancing in her teens with the Delta Sundancers Square Dance Club and also continued competing in Square Dancing, Calling and Cueing. She danced and competed in squares made up of dancers from a number of Canadian and American clubs at the teen festival. Shortly after completing High School while Heather was preparing for College, Dennis Dixon, the Caller of the Mission Grand Squares became ill and was no longer able to continue with his Calling duties. At his request, Heather was asked to step in as the fulltime Caller for the Mission Grand Squares. During this time period Heather was learning more and more about being a professional Caller. She continued to have support from Callers, such as Ken (& Sally) Crisp and Dan (& Anita Adams). Since the Mission and Abbotsford Grand Squares were closely knit, Ken and Sally quickly became part of Heather's Square Dance family. After Ken Crisp's retirement from Calling for the Abbotsford Grand Squares in September 2010, Heather stepped in as the fulltime Caller for AGS, where she is the Caller/Cuer to this day. The Swinging Singles of BC Square Dance Club was thrilled to have Heather accept their invitation to become their New Dancer and Mainstream Instructor Caller in September 2014. Heather’s activities have gone beyond the club level. She has called & cued dances in the Okanagan and Thompson Shuswap. Heather was the Round Dance coordinator for six years for the Vancouver & District Caller/Teachers Association, being responsible for the selection of the Round of the Month. Heather was also the Vice President of the Vancouver & District Caller/Teachers Association for two years. This young woman is extremely talented; calling and cueing expertise is critical when teaching new dancers in a way which they can relate to new genres of dance. Her capability to apply direction, knowledge and humour in some very emotional moments is uncanny. Her choice of music, in relation to the mood of the day, along with her singing capabilities is extraordinary. Heather Wallace does all this and more.